Tomorrow night choirs of angels will sing as Doctor Who returns for another season. Sigh. In honor of that blessed occasion, and because it’s a topic worth looking at, today we’re going to discuss Amy and Rory Pond and their decidedly unique marriage. As if we’d talk about anything else. For those of you who are still (somehow) unaware of Doctor Who, the plot is basically as follows: a 1200-year-old alien flies around time and space in his bigger-on-the-inside spaceship. Along the way he solves problems, incites revolutions, and sees neat stuff. He usually takes a human companion or two along for the ride, generally grabbing them from (coincidentally, no doubt) 20th-21st century London. Amy Pond trundled along in season five of the new series (Doctor Who has been on and off the air since 1963—its incarnation from 2005 on is referred to as New Who). She was a sweet little Scottish girl displaced in Leadworth, who happened to have a very scary crack in her wall. The Doctor turned up and tried to fix it, but had to come back. He came back twelve years later to find Amy Pond all grown up. No matter, though, because they were off to go on adventures together! Older Amy, though, had a secret. They were running away on the night before her wedding, because she was having some pre-marital doubts about committing to Rory Williams, her childhood sweetheart. When the Doctor found out, he grabbed Rory and dragged him along for the ride, helping Amy to realize what their relationship is, and giving Rory the experience of a lifetime. That’s the short cute version. Here’s the long emotional one. When we meet Amy for the third time (hard to explain), she’s not sure if she wants to settle for her little life in Leadworth. She’s always wanted adventure, and while she loves Rory, she wants a more exciting life. So she runs away. That’s not awful, and it’s at least good that she decided to deal with her fears the night before her wedding and not after. Amy displaces some of her feelings onto the Doctor and pursues a semi-serious flirtation with him. 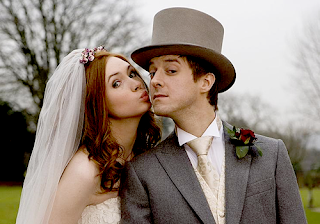 Some fans claimed that if Rory and Amy’s roles were flipped, and Rory was the one running out on his bride the night before the wedding, everyone would point at their relationship and call it unhealthy. Which is true. Ish. But the important things to note here are that, one, Amy is very young and doesn’t know what she wants, and two, Amy and Rory’s roles aren’t reversed. What we have is what we have. So. Amy runs out on her wedding. She only comes back when the Doctor realizes what’s wrong and goes after her fiancé. Rory is understandably miffed that the love of his life decided to swan off instead of getting married, but he understands that Amy needs time. The adventures that they go on with the Doctor give their relationship new weight and meaning. It’s lovely to watch. Really. It’s also interesting to watch Rory trying to deal with being the Doctor’s companion, because, unlike the rest of the companions, Rory didn’t need fixing. He was perfectly happy as he was. He’s just there because Amy is, and he’ll follow her anywhere. That, for the record, is a large part of what makes their relationship so compelling. Rory will follow Amy anywhere. It doesn’t bother him, emasculate him, or in any way even register for him that Amy is a more dominant personality. Yes, Amy loves adventure. No, Rory doesn’t especially. But he loves Amy, and if adventure’s what she wants, then he’ll go too. This is phenomenally different from most relationship dynamics we see in sci-fi and action movies. Generally, it’s the man who has the noble vision, and the woman who is willing to do whatever it takes and follow him wherever he leads. That’s a very common trope. So it’s lovely to see an inversion of that, where not only will Rory follow Amy, but he also genuinely doesn’t mind. Their relationship is taken to the extreme in the end of season five, when (SPOILERS) Amy is shot and Rory (currently immortal, don’t ask) decides to stay with her. She is locked inside a magical prison, the Pandorica, where she will stay in stasis until she can be healed. Rory, realizing that this could take thousands of years, just picks up his sword and waits. And waits. And then we jump to the future, two thousand years, and there is Rory. Waiting. If that’s not love, I have literally no idea what is. Now, again, we run into people who say that if Amy and Rory were reversed, and Rory was in the box, would Amy’s endless waiting be cool or sexist? Here’s the thing: it would still be love. The problem I have with the male-adventurer/female-tagalong prototype is not that it’s untrue or unentertaining. It’s that it’s disproportionately common. I have no objection to this character framework in general, but I resist the idea that it is the only valid one. I celebrate couples like Amy and Rory who exist outside those bounds. But if Amy and Rory were the other way round, they’d still be a loving, devoted couple. Just a more common one. At the end of season five, they finally make it to the wedding. 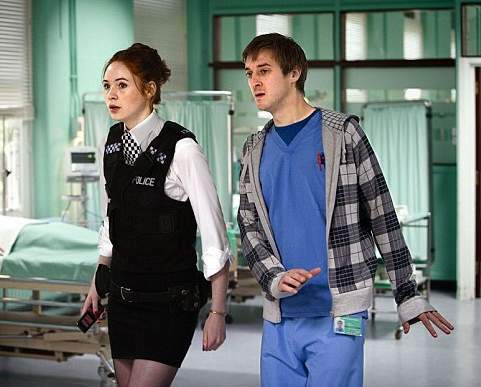 The world is saved, and the Doctor makes a cute crack about how they are now officially Mr. and Mrs. Pond. Rory shakes his head, but then agrees. And, again, it doesn’t bother him. 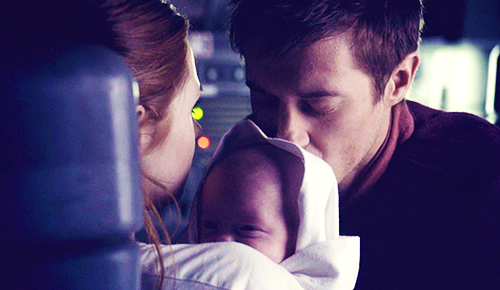 The idea of taking his wife’s last name, that their child eventually carries her last name, and the concept that for the rest of the show they are known as “The Ponds” is a non-issue for him. That’s virtually unheard of. Amy’s a flirt. She’s incorrigible, really. But that doesn’t bother Rory, because he knows that in the end he’s the one she chose. I have to say it, if Rory was a woman whose partner flirted that much and was so confident it didn’t bother her, I’d be just as over the moon. What the Ponds really give us is an archetype for what a healthy relationship is. I’m not saying they’re perfect, because they’re not, just that they are a really good basis for a loving marriage. They respect each other, and know each others’ strengths. They truly love each other. And they are both confident enough in their relationship that they feel no need to project their insecurities onto others. Ultimately, it's all about equality. Not demanding that you do the same things, have the exact same amount of earning power or anything like that. It's the equality of knowing that both members of the relationship are equally invested. That you both have the exact same thing to lose, and that you are equally capable of supporting each other. It's perfectly fine for one person to be more dominant than the other. A healthy relationship is just one where you're both truly okay with that. So, here’s to you, Ponds! May your final days in the TARDIS be just as mental as your first ones. And in honor of the Doctor Who premiere, have an episode of "Pond Life", the adorable BBC short follow the homelife of our beloved Ponds and their pesky son-in-law. Just fabulous.